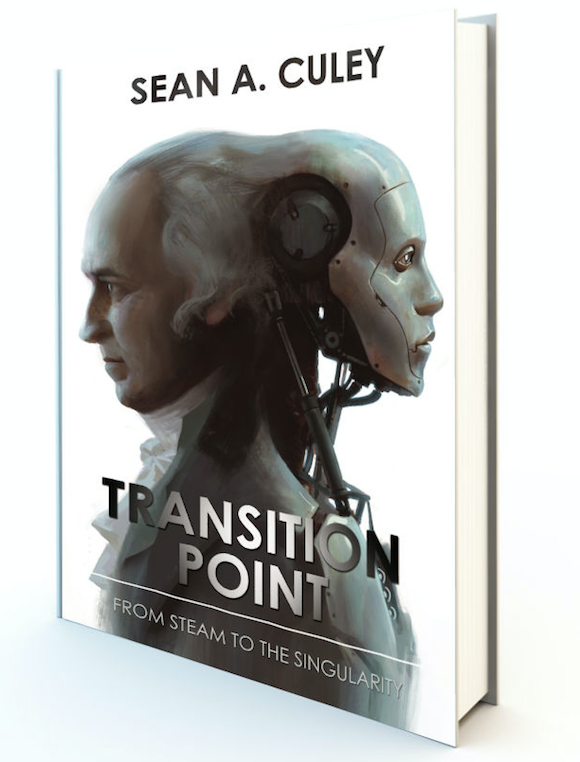 'Transition Point: From Steam to the Singularity' now available! We live in disruptive times. The world is changing faster than ever before, leaving people dazed, businesses struggling, economies floundering and societies fracturing. But why? 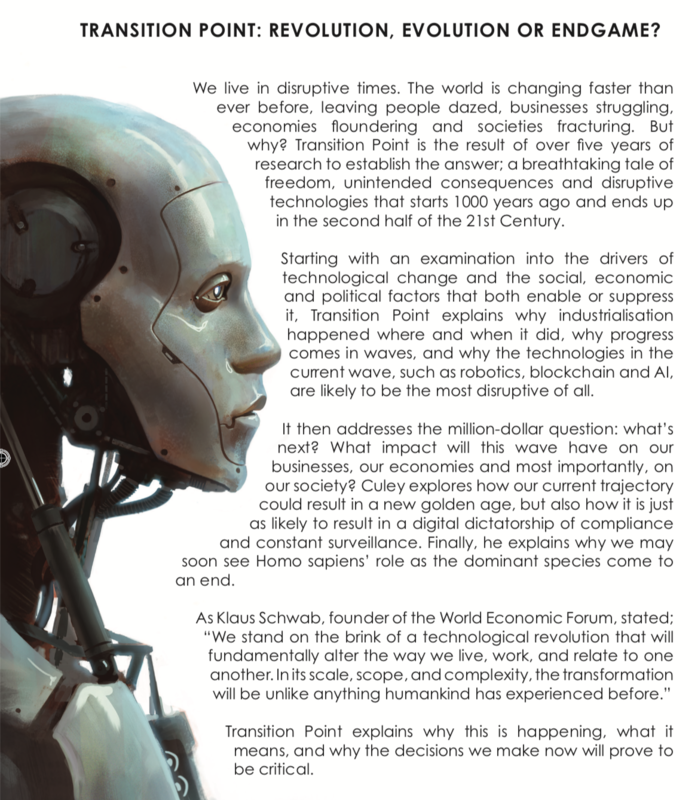 Transition Point is the result of over five years of research to establish the answer; a breathtaking tale of freedom, unintended consequences and disruptive technologies that starts 1000 years ago and ends up in the second half of the 21st Century. Click here to read a selection of quotes from the book. Starting with an examination into the drivers of technological change and the social, economic and political factors that both enable or suppress it, Transition Point explains why industrialisation happened where and when it did, why progress comes in waves, and why the technologies in the current wave, such as robotics, blockchain and AI, are likely to be the most disruptive of all. It then addresses the million-dollar question: what’s next? What impact will this wave have on our businesses, our economies and most importantly, on our society? Culey explores how our current trajectory could result in a new golden age, but also how it is just as likely to result in a digital dictatorship of compliance and constant surveillance. Finally, he explains why we may soon see Homo sapiens’ role as the dominant species come to an end. As Klaus Schwab, founder of the World Economic Forum, stated; "We stand on the brink of a technological revolution that will fundamentally alter the way we live, work, and relate to one another. In its scale, scope, and complexity, the transformation will be unlike anything humankind has experienced before." Transition Point explains why this is happening, what it means, and why the decisions we make now will prove to be critical. 'Transition Point' is now available in Hardback, Paperback & eBook format from Amazon and all good bookstores. For author signed copies, please email sean@seanculey.com. Audible version due mid 2019. Interview with Sean Culey following opening keynote at the Momentum conference in Prague, October 2018, where Sean discusses the digital revolution, the increasing rise of artificial intelligence and robotics in industry and the impact that these technologies are likely to have on the economy and society. S&OP – A vision for the future: An Interview with Sean Culey. In the last 30 years S&OP improved performance in many businesses. However, S&OP has not yet substantially delivered on its ultimate promise of enterprise wide resource management, rolling financial forecasting and strategy deployment. In this interview at the 2017 P3 Logistics Conference in Prague, Sean discusses concepts such as delivery motherships, why voice is the new interface, the biggest challenges for humanity in a world of AI and robots, whether he is positive or negative about the future, and the extent to which robots will replace human labour. In this article on Forbes Sean goes beyond the rhetoric and investigates whether China, robots or just changing economics is the real reason for the decline in manufacturing in the US. He proposes an approach to breathe new life into these areas and revitalise the manufacturing industry. 15-16 May 2018. Day two opening keynote. The 2017 P3 Conference: Future Now will prepare you for all of the changes and new trends approaching on the horizon. Will industrial robots sweep aside millions of human jobs, or create thousands of new smart businesses? This report by journalist Chris Middleton on Sean’s keynote at The Rise of the Machines summit in London. 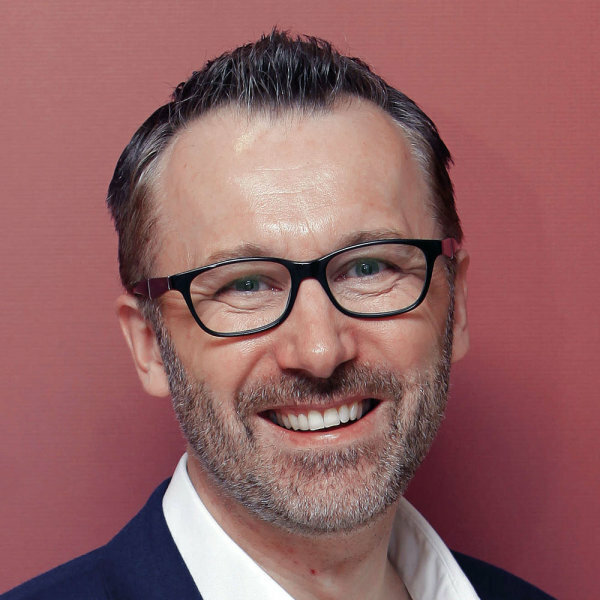 In this article, Sean describes how leading organisations are able to align and integrate their organisation, and he offers advice and guidance as to how to create these ‘solid foundations’ so that they form a platform for growth and success for your business. New Blogs, (e)Books, Publications, Events, Speaking dates and Forthcoming Workshops.